Summer is by FAR my favorite time of the year. And it’s not just because of the nice weather, the long lazy summer days, or that I get to spend more time with the kiddos. One of the main reasons I love summer so much is because it’s GARDENING season! 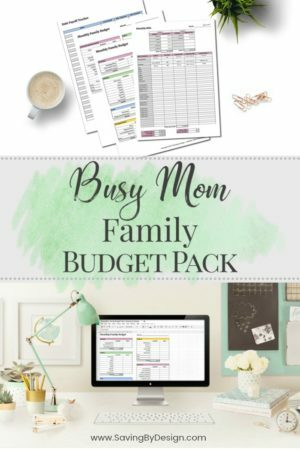 And while I love to cook with the fresh fruits and veggies my family grows, I also love to plan out my canning recipes and ideas so we can enjoy homegrown food all year long! I hope you enjoy this post with awesome canning recipes, storage ideas, and other spectacular canning tricks! Canning really is a great (and cheap) way to preserve the food you work hard on growing all year long. 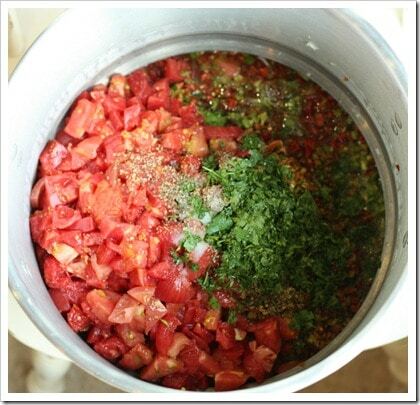 Water-bath canning is the most common type and is great for acidic fruits and vegetables, such as jams, jellies, applesauce, and tomatoes. Here are some “must-have’s” when looking to start this great adventure! Check out these articles at PreparednessMama.com and OldWorldGardenFarms.com. They both explain the equipment you’re going to need before starting and the “must-haves” in a much more concise manner than I’d be able to! It’s a perfect tutorial to get you started! 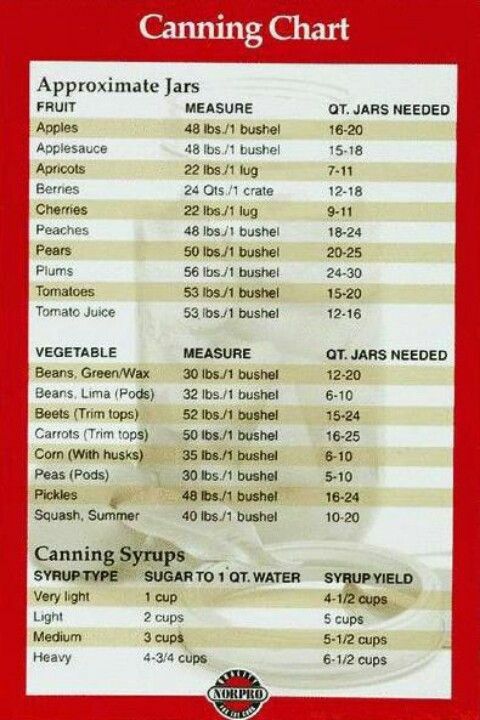 Check out this great Canning Measurement Chart that I found over on Pinterest! It’s always important to make sure you’re ready and have the correct measurements on queue before starting. This chart is a lifesaver! This KnitAndNosh.typepad.com article does a wonderful job of going through the Pressure Canning Method in a not-so-intimidating way! I swear it’s not as complicated as it sounds and it’s a must-do if you’re planning on canning a majority of things from your garden. Grab yourself a pressure canner and get started! Now that we’re past the logistics, let’s have some fun! If you’re looking for recipes, do I have a spot for you! 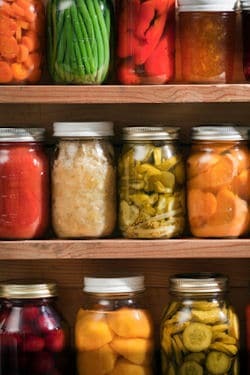 Check out these 80+ Recipes for Home Canning at TipNut.com. This resource has EVERYTHING you can imagine for canning Fruits and Veggies! Everything! Looking for recipes for Asparagus, Beets, Cabbage, Carrots, Cherries, Cucumbers, Green Beans, Onions, Peaches, Pears, Peas, Peppers, Potatoes, Radishes or Tomatoes? This is your mecca! And it’s not just typical recipes, there are different variations with these vegetables to make things even more fun and tasty! One of my favorite fruits to can are apples. Especially Apple Butter! 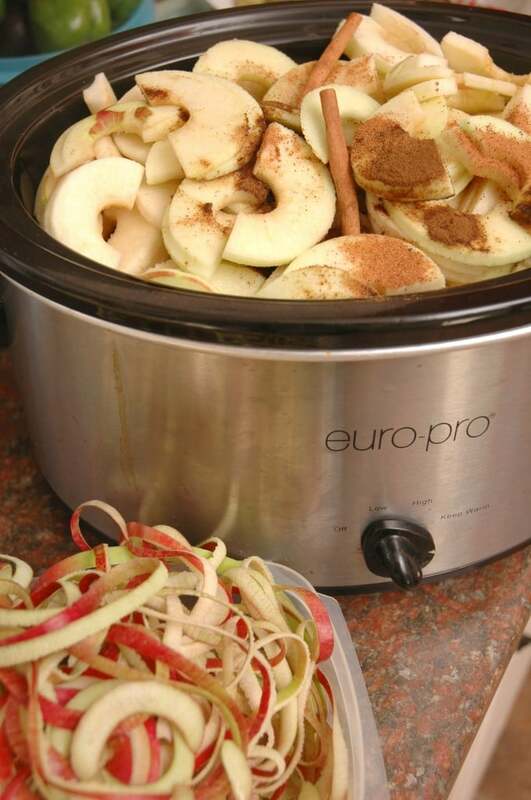 This recipe involves using a crock pot to get things all ready before canning and it is SO YUMMY! Check it out at Teacher-Chef.com! Salsa! 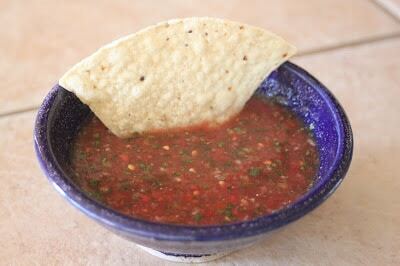 I swear by homemade salsa! Everyone loves it, it’s great to break out at parties, and even better when you brag about it being HOMEMADE! Look over these two recipes at SuperHealthyKids.com and EmbellishGoods.blogspot.com and you’re sure to come up with your own flair! I love making pie fillings to use sporadically throughout the year. One of my favorites? Rhubarb Pie! 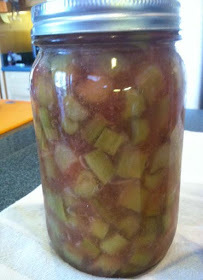 Check out this Rhubarb Pie Filling recipe at SBCanning.com! 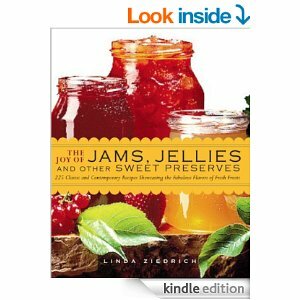 Jams, Jellies, and Preserves, OH MY! A simple Google or Pinterest search will bring up a tons of options for you to go with for Recipes, but I personally love this book at Amazon.com. It helps to walk me through things and gives me a ton of ideas for future canning options, as well as what I can tackle during different seasons of the year when different fruits ripen. You’ll love it and there is NOTHING better than homemade jelly! This recipe takes a bit of a different twist. Looking for something to make WITH all of the items you canned? 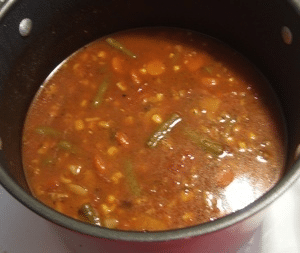 How about this excellent soup that would be delicious during the cold, dreary winter! Use vegetables you already canned for this recipe at ThriftyFun.com. I love making meals with my canned inventory! Last but not least… I really don’t like to waste a lot when I’m canning the items I worked so hard to grow. When it comes to apples, there is a lot to discard between the apple peelings and cores. But guess what?!?! I have an answer to even use that waste! 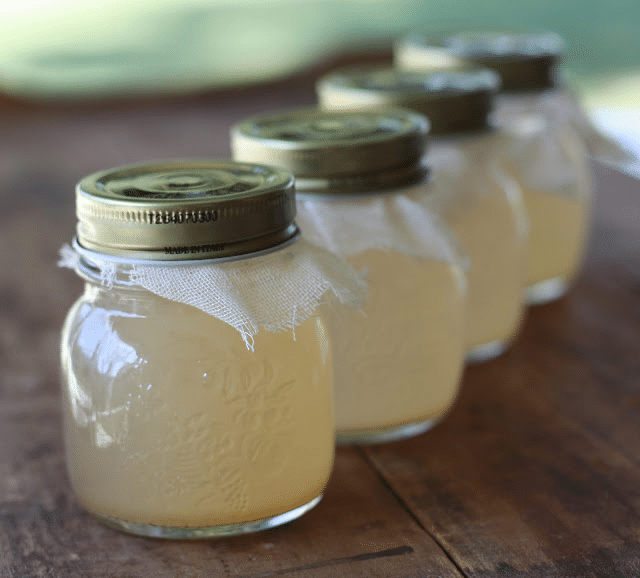 How about trying to make your own Apple Vinegar, which you will be able to can once it’s done! Check out this recipe at 17apart.com. No need to waste here! 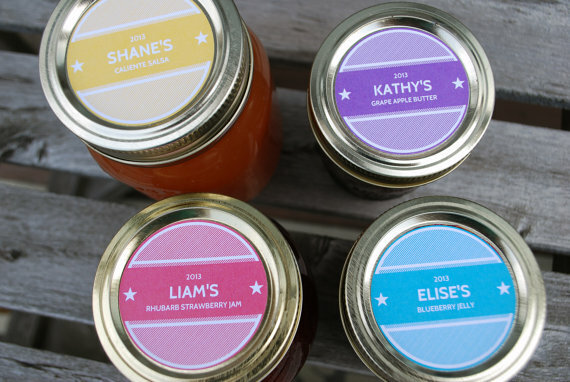 First off, labeling your canning masterpieces once they are cool and ready to be stored is a MUST! 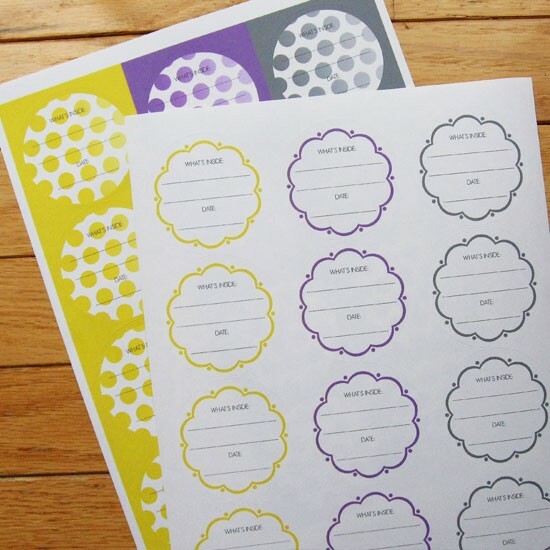 Check out these awesome finds for labels that are chic, fun, and informative when it’s time to make sure you know what is what! Etsy is by far my favorite place to find unique canning labels. If you’re unsure what you’re looking for, check out this Etsy Link to see the many different canning labels that people have made! I have specifically used these labels above from Etsy.com, along with these, also above from Etsy.com. I love them! 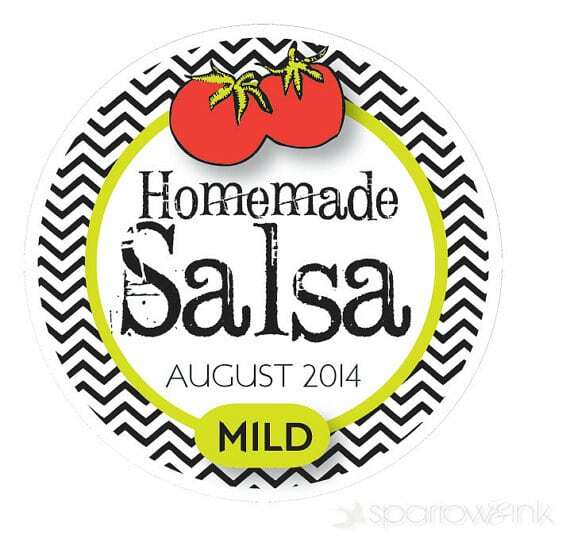 This year I’m going to make some Salsa and I’m totally trying out these awesome labels from Etsy.com. How fun! OK, so this is my dream storage area for all of my canning, herb drying, garden items, etc. that I hope to have in the future! I found this at CanningAcrossAmerica.com! 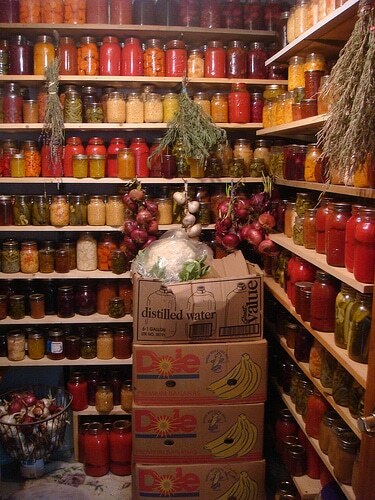 This nice, cool basement room is PERFECT to store your canning items in. It keeps them at a great temperature and is a great way to keep everything organized and balanced. I love how this has room for garden items like onions and potatoes, as well as a great place to dry herbs. LOVE! If you’re feeling up to the challenge (or can convince someone to do it for you like I hope to! 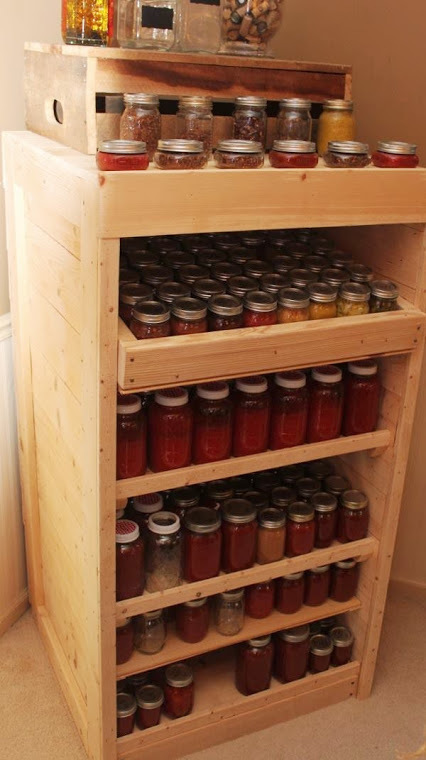 ), try building your own Canning Pantry using Pallets! AWESOME! Check out the instructions and guide at OldWorldGardenFarms.com. One final thing before storage is to make sure you have an easy inventory list so you know what you have and what is running low! I wish I would have had something like this the first year I started canning, instead of searching through EVERY jar during the winter wondering if I had specific things left! 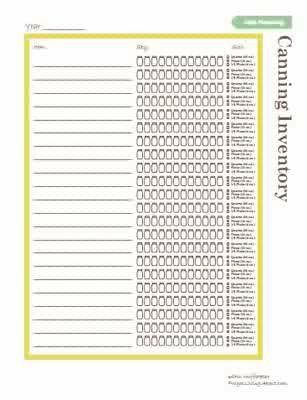 Check out this Printable Canning Inventory List at ArkansasFarmerette2012.wordpress.com. it’s a MUST HAVE! Canning is such a great way to make sure you’re eating your garden abundance all year long. It’s also an awesome way to know exactly what you’re feeding your family and gives you such a sense of accomplishment! I love knowing where my family’s fruits and veggies are coming from all year and I hope these recipes and ideas will inspire you to start canning soon, as well! Enjoy! … if only I wasnt terrified to start canning! I was terrified too! And….I just got a few things from Walmart (big ol’ water bath pot with lid and rack, a couple boxes of jars, the canning kit with tongs etc and a sack of plums!) and I just jumped in! I figured I couldn’t screw up jam! The first time was intimidating because I was following the instructions on the sure-jell paper and it totally got me frustrated, but I just used my noggin and it worked out beautifully! I just wanted to do a couple batches of SOMETHING before my garden started putting out. I loved it so much, I got all the berries from my fridge and did another batch of mixed berry jam…THEN I went to the store and got a ga-zillion jalapeno peppers and pickled them! Tee Hee! I am hooked. Now, im saving for the pressure cooker to do my veggies in the summer. Since I haven’t used one before, it makes me nervous. But I think as long as there are videos and how to’s, it’ll be ok.
Great start but don’t wait until summer to process foods. Start with dry beans. Sometimes, well most times when I want a bean burrito I don’t want to wait. Nothing like going into the pantry opening a jar of beans and in 20 minutes we are enjoying the best bean burritos ever. Soups? Go for it. You are making a huge pot anyway so why not can part or all of the leftovers ? Just remember, do not add pasta or rice to your soups, add this after you have opened and heated the soup.. You will process soups for the times of the longest cooking ingredient—if ingredient # 1 cooks longer then ingredient # 3 process for the longest time. Before you know it you will have a large selection of foods in your pantry and be the envy of your friends and family!! Follow the rules and all will be fine and remember, if in doubt, throw it out. 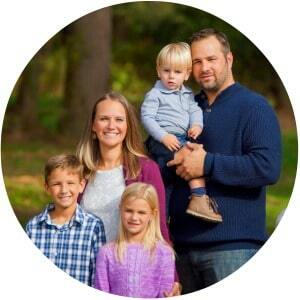 Don’t take chances with your families health. 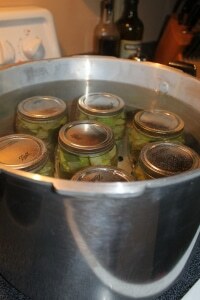 I was scared at first also but I’ve been canning for about 1 year I love it did you ever get started on yours? …still haven’t started!! Now we have an infant at home, maybe some fresh baby food this summer!?? 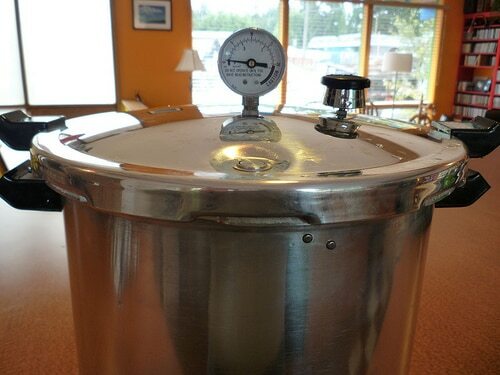 I just purchased the very same pressure canner that is pictured at the beginning of your blog. And I also just finished 2 cases of quart size jars of beef pot roast and 1 case of taco meat. This canner is the bomb. My oldest grandson had to try the roast and he is forever spoiled. Thank you for taking time out to blog here. So my husband and I bought a new home on 10 acres earlier this year. We made a sad attempt at a garden but he was gone most of the time working on our previous house so we could get it on the market and I traveled a lot with my job and so it didn’t turn out very well. The circumstances have changed this year and so gardening we will be doing! I am spending time better understanding both gardening and canning this winter in preparation. I see that getting a pressure canner seems to be a must. Do you recommend starting with any particular fruit or vegetable? I want to practice some before we go all in with a larger garden. Happy to hear your thoughts.